A worm drive is one simple worm gear set mechanism in which a worm meshes with a worm gear. Even it is simple, there are two important elements: worm and worm gear. (They are also called the worm and worm wheel) The worm and worm wheel is important motion control component providing large speed reductions. It can reduce the rotational speed or increase the torque output. 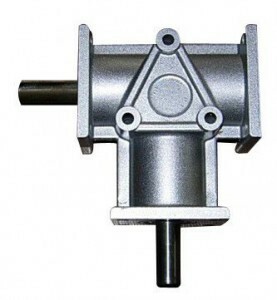 The worm drive motion advantage is that they can transfer motion in right angle. It also has an interesting property: the worm or worm shaft can easily turn the gear, but the gear can not turn the worm. This worm drive self-locking feature let the worm gear has a brake function in conveyor systems or lifting systems. The most important applications of worm gears is used in worm gear box. A worm gearbox is called a worm reduction gearbox, worm gear reducer or a worm drive gearbox. It consists of worm gears, shafts, bearings, and box frames. The worm gear, shafts, bearings load are supported by the box shell. So, the gearbox housing must have sufficient hardness. Otherwise, it will result in lower transmission quality. As the worm gearbox comes with a durable, transmission ratio, small size, self-locking capability, and simple structure, it is often used across a wide range of industries: Rotary table or turntable, material dosing systems, auto feed machinery, stacking machine, belt conveyors, farm picking lorries and more automation industry. How to Select High Efficient Worm Gearbox? 1) Helix angle. The worm gear drive efficiency mostly depend on the helix angle of the worm. Usually, multiple thread worms and gears is more efficient than single thread worms. Proper thread worms can increase efficiency. 2) Lubrication. To choose a brand lubricating oil is an essential factor to improve worm gearbox efficiency. As the proper lubrication can reduce worm gear action friction and heat. 3) Material selection and Gear Manufacturing Technology. For worm shaft, the material should be hardened steel. The worm gear material should be aluminium bronze. By reducing the worm gear hardness, the friction on the worm teeth is reduced. In worm manufacturing, to use the specialized machine for gear cutting and tooth grinding of worms also can increase worm gearbox efficiency. From a large transmission gearbox power to an even small worm gearbox load, you can choose one from a wide range of worm reducer that precisely fits your application requirements. 1) You can complete the installation in six different ways. 2) The installation must be solid and reliable. 3) Make sure to check the connection between the motor and the worm gear reducer. 4) You must use flexible cables and wiring for a manual installation. With the help of the most advanced science and drive technology, we have developed several unique “square box” designed from high-quality aluminium die casting with a beautiful appearance. The modular worm gearbox design series: worm drive gearbox, parallel shaft gearbox, bevel helical gearbox, spiral bevel gearbox, coaxial gearbox, right angle gearbox. An NMRV series gearbox is a standard worm gearbox with a bronze worm gear and a worm. Our Helical gearbox product line comprises of four universal series (R/S/K/F) and a step-less speed variation UDL series. Their structure and function are similar to an NMRV worm gearbox. What Can Power Jack Motion do? Power Jack Motion Group supplies motion control products for industrial automation and smart home appliances. Our core product line includes electric motors, linear actuators, worm gearboxes and planetary gearboxes. We have BLDC pump and blower fan product line as well. As we are China based, we have the advantage of extensive resources, good quality, and competitive price. Thus, we can help our clients make more profit and explore new market opportunities. Can Power Jack Motion offer custom-made products? Yes. We have listed the main OEM steps to help you learn how we make the customized products. Which are the business product lines for OEM services? Presently, we can produce custom-made electric motors, linear actuators, and gearboxes for your special projects. Several clients ask us to make custom-made brush motors for their machines. Not really. For a first-time deal, you need to pay for sample cost, it will be deducted from your next order.